What is Content Marketing and SEO All About? Doing content marketing without SEO is like driving down the road with your eyes closed. There’s a chance you’ll get where you’re trying to go but, more than likely, you’re going to drive off a cliff and never be found. Okay, that was a bit extreme, but I stand by my metaphorical explanation and by the end of this post you’ll understand why. But, before we explore the inseparable relationship between content marketing and SEO, let’s first define these two critical marketing concepts. Even if you don’t know exactly what content marketing is, you’ve most certainly been exposed to it. It’s when a company or brand presents you with information, advice, or entertainment in hopes of appealing to a need of yours. A formal definition of content marketing is “a strategic marketing approach focused on creating and distributing valuable, relevant, and consistent content to attract and retain a clearly defined audience – and, ultimately, to drive profitable customer action.” This content can be delivered through many different media-types. Youtube videos, Instagram posts, product descriptions, and even this blog post are all considered content marketing. 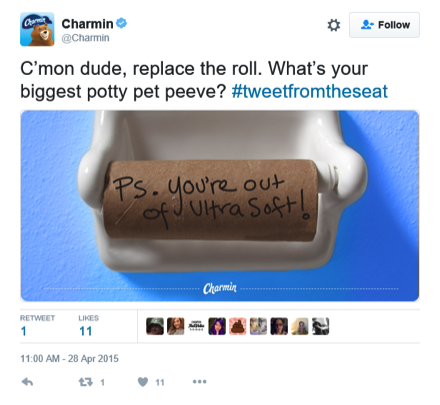 This Twitter post from Charmin is a prime example of content marketing. Now, it’s important to note that content marketing is not exclusively digital. It can take the form of in-person events, speeches, or print magazines. However, the majority of content marketing is now delivered digitally and that’s simply because digital platforms like Google and Facebook are where the people are. It’s where big data lives and that makes it the most effective way to reach that “clearly defined audience” and to deliver messages to that audience “consistently.” So, while non-digital content should be a part of any content marketing strategy, it certainly is not the bread-and-butter of this concept today. SEO stands for search engine optimization. To give it some context, SEO is a direct result of the information age we currently find ourselves in. Its purpose is to bring order to the influx of content that is currently swimming around the internet and to provide standards for organizing the billions of search results that are delivered every day. SEO is most prominently dictated by Google and its extensive relevancy (there’s that word again) algorithm which is updated often in order to maintain a helpful grasp on the millions of content pieces being added daily. Google’s search engine algorithm aims to give users the information they’re looking for. Essentially, Google’s goal is to ensure that when someone types a question into their search bar, they’re shown the most accurate, relevant, and up to date results possible. Their algorithm is constantly crawling billions of website pages across the internet in an attempt to ensure that this happens. By analyzing a website’s on-page content, plus some other information that lives on the back-end of pages, it is able to determine how helpful that page will be for any given search. When you Google something, know that those 10 results you see on the first page didn’t just get there by chance, they were constructed in a way that pleased the Google algorithm. In addition, Amazon, Facebook, Instagram, Youtube, and other sites with large amounts of searchable content have their own algorithms. Do we really need more content? So, now that you understand the general purpose of SEO, and how it works tirelessly to organize the massive amount of content on the internet, a reasonable response might be, don’t we already have enough content? Why is it so important to add more? It’s true, the internet is a deep ocean of information that seemingly spans every possible subject matter out there. But, remember the definition of content marketing. It specifically describes the content as needing to be “valuable” and “relevant”. Those words most certainly do not describe all the content on the internet or, one could argue, those words don’t describe the majority of content on the internet. Plus, the other important part of content marketing is consistency. Humans crave freshness and, whether it’s a scientific breakthrough or a new funny cat video, novel content will always be in demand. People want it. They search for it. That’s why content marketing is such a big deal. The tricky part of SEO is that Google doesn’t share exactly how their all-powerful algorithm is constructed. So, SEO experts are constantly performing A/B tests in order to gain insight into what helps a webpage rank higher. Ranking at the top of a Google search results page is vital to the organic success of your digital content. An Advanced Web Ranking click-through-rate study found that the top search result is clicked on 33% of the time, while the second one is clicked on 13%, and the third just 9% of the time. So, you can see how much content marketing relies on SEO. But, SEO also relies on content marketing. Any SEO expert will tell you, the first step to optimizing your website pages is to perform keyword research to determine what words and phrases you should include in your on-page content (Page titles, headers, body copy, etc). Likewise, any content marketing expert will tell you that the first step to writing impactful digital content is, you got it, keyword research. Doing content marketing without keyword research is like attempting to make a dish for a party with people you’ve never met Yes! There’s the more mild metaphor I was searching for earlier. Maybe you decide to bring a whole bunch of ice cream and toppings (because who doesn’t like ice cream). Then, during the party you either find out that a) half the people there are lactose intolerant or b) the party-goers like ice cream so much that three other people also brought ice cream. Whoops. If only you could have done keyword research on these people first. Nothing tells the Google search engine what a webpage is about, and how helpful it can be to a person, better than words. After all, a Google search is nothing more than words in a text box. Search engine optimization algorithms organize these words in an attempt to create efficient bridges between content creators and content consumers. Even the rank of visual content is determined by words. Algorithms can’t see photos or watch videos. They rely on photo captions, video titles and descriptions, on-page transcripts, and hidden alt-text descriptions to determine the quality of this content. That’s why keyword research must be the starting point of all content creation. Keyword research is the process of determining which words and phrases people are using to search the internet, and what the chance is for your content to be found by those people. Some words are searched for more than others, but there’s also likely more competition around these words. 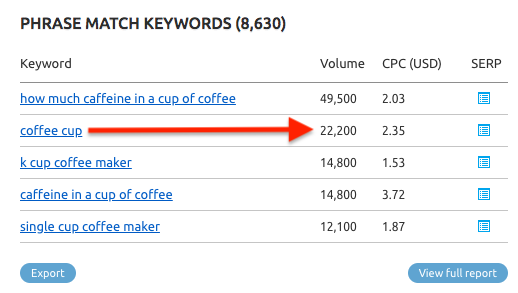 Sometimes, keyword research reveals that a synonym of a word is actually searched for more frequently than the word you would have used to describe your content. For example, when you Google the words “coffee cup” you get 698,000,000 results. When you Google “coffee mug,” just 206,000,000 results appear. Certainly less competition to get past if you go with the latter. 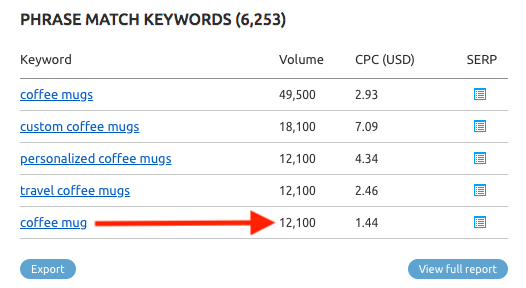 But, when these two phrases are plugged into a keyword planner tool (in this case I used SEMRush), it’s discovered that there are about 22,200 monthly searches for “coffee cup” and only 12,100 monthly searches for “coffee mug”. 1. Being searched for at all (valuable). 2. Landing a spot at the top of Google’s search results (relevancy). What Should a Content Creator Do? A content writer must be aware of all this, but not let it dictate too much of their writing. Remember, the primary goal of a content creator should always be to help readers or viewers understand the topic fully and provide real value. Google agrees. Their algorithm takes readability and inclusion of original content into consideration. So, if you just repeat the same keywords over and over again without providing any real substance, your writing won’t rank well. And even if it did, no one wants to read a keyword stuffed sentence about keywords that is so stuffed with keywords it can’t possibly include any more keywords. See what I mean? SEO and modern content marketing are both a science and an art. There are no certainties. It takes in-depth research, solid writing skills, and many educated guesses. A comprehensive SEO audit is the first place to start when determining the effectiveness of your website’s content. Among other things, this audit analyzes keyword optimization, URL structure, on-page content, discovery and indexing ability, and potential tactics for increasing organic search volume. Leverage us today to get started.